After 3:30pm only Priority services are available. After 4:30pm only Bullet services are available. Bullet Service has priority over all other work. Rush Express is a premier courier service in Sydney. The name is synonymous with quality courier service, punctuality and compliance to customer needs. We primarily serve the Sydney area but our services are also extended to cover the whole of New South Wales. We provide a 24-hour courier service from Monday to Friday. We are available on call on weekends, which means that we work whenever there is a courier service demanded by a client. The Budget Service is classed as a service where it is not critical to be delivered in any real time frame. It is a cost effective service with a delivery window of between 4 and 5 hours from time of booking Note that this service is available with on-line bookings only and available up to 1.00pm then Standard services must be used unless pre booking for the following day. The Standard Service that Rush Express offer is for local delivery’s that have a delivery window of between 3 and 4 hours from time of booking and available up to 2.00pm After 2.00pm the Priority services must be used unless pre booking for the following day. The Priority Service is available on request also with a high importance and with a delivery window of between 2 and 3 hours from time of booking and available up to 3.00pm. After 3.00pm the Bullet service must be used unless pre booking for the following day. Bookings, All bookings can be made by phoning 1300 787-448. If you prefer, you can also make bookings online by just signing up for an account here on our website. You will then receive a log in code and password and will be able to book online. Once the account is established, customers can find out the costs of transporting their goods. 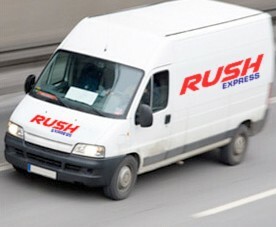 Rush Express guarantees that the prices of our courier services in Sydney are very competitive with industry standards. Apart from courier services in Sydney, Rush Express also offers warehousing and distribution services to all our clients. 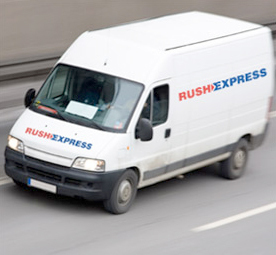 Rush Express offers a pick and pack service with an In-house Courier, Taxi Truck, Pallet and Parcel delivery Service. We ensure that our courier services meet all our clients’ time and quality specifications. We aim to build long lasting relationships with our clients so view our website to find out more on how we can be of service to you.